Albuquerque, N.M.–On July 19, 2014 two Diné men, Allison “Cowboy” Gorman and Kee “Rabbit” Thompson, were found beaten to death in a dirt lot on the west side of Albuquerque. Because of the severe and brutal nature of the beatings, their murders made national headlines. A flurry of political activity erupted in the wake of the murders. Officials from the Navajo Nation, including then-President Ben Shelly, flew to Albuquerque to meet with Mayor Richard Berry to devise a task force on Native homelessness in the city. The Navajo Nation Human Rights Commission launched an investigation of conditions for Navajo and Native homeless in Albuquerque. Indian Country Today Media Network reported in October 2014 that a seventeen member task force headed by Sherrick Roanhorse was established in response to Gorman’s and Thompson’s murders. The purpose of the task force is to identify resources and improve the quality of life for Native Americans in Albuquerque. 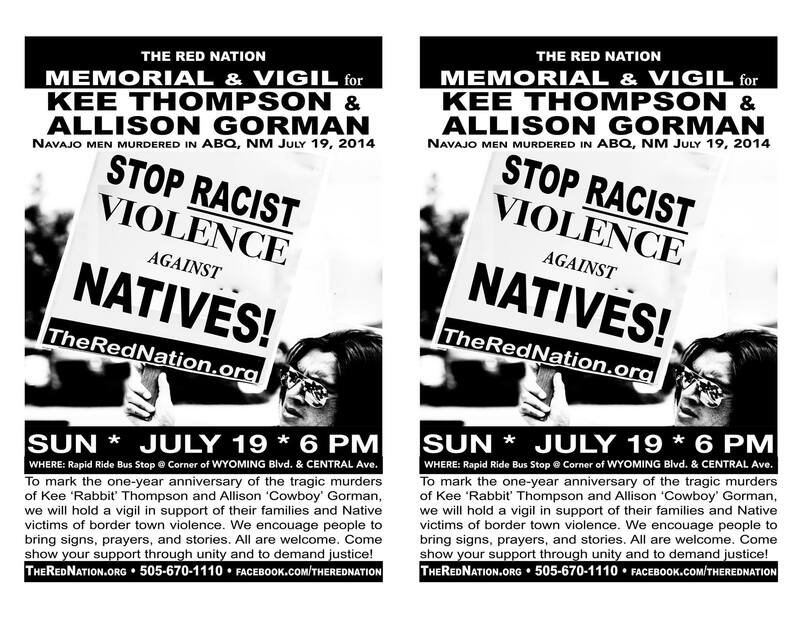 On the one year anniversary of Gorman’s and Thompson’s tragic deaths, The Red Nation calls for a memorial and vigil to remember and honor their lives, and to recognize our relatives struggling for dignity and humanity in violent border towns. We call on all people to stand in support and solidarity with Thompson’s and Gorman’s surviving families and to bring attention to the ongoing crisis of racist violence against Native poor and homeless in border towns like Albuquerque. This pattern of violence and racism can no longer go unnoticed. Too many families have suffered. It must stop! We ask people to bring their prayers, stories and signs to remember the families and victims of border town violence. Make your voices heard! The Red Nation formed in December 2014 out of a desire to contribute to the widespread resurgence of strong, vocal, organized and radical Indigenous struggle in Albuquerque and beyond. We formed to address the marginalization and invisibility of Indigenous struggles within mainstream social justice organizing, and to speak out and strategically fight against the ongoing destruction of Indigenous life and land. The Red Nation is a coalition of Indigenous and non-Indigenous activists, community members, students, organizers, revolutionaries, intellectuals, and educators dedicated to building a widespread movement to liberate Indigenous Peoples from colonialism.